This tutorial will introduce you to submitting ANSYS jobs in batch to the Rescale platform. We will create an input file from the respective ANSYS software, start a Rescale job, submit, and transfer the results back to ANSYS. Pre-processing activities (e.g. geometry, mesh/model) are already completed and all solver and setup settings are already determined as well. 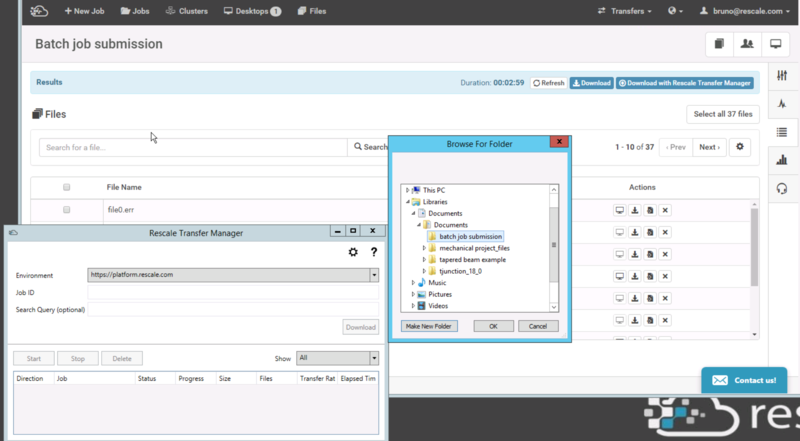 Unlike job submission through RSM, you do not need to launch Rescale Desktops. You can use your own ANSYS software and license or reach out to us and purchase some Elastic License Units (ELUs). 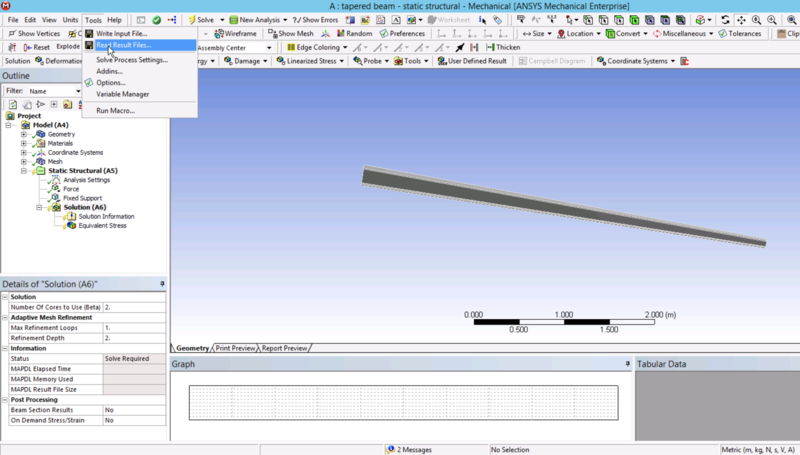 This tutorial focuses on static structural analysis for a tapered beam in ANSYS Mechanical 18.0 and demonstrates how to submit the run as a batch job on the Rescale platform. The example model is a 15-foot long tapered I-beam made of steel. It&apos;s fixed at the larger end and a 500-lb force is applied at the smaller end. To obtain the Workbench project file (.wbpz) for the tutorial, please click on the Import Workbench project link below and click on the Save option located on the top right corner of the job submission page to have a copy of this file in your Rescale cloud files. Before we create the input file, please check that the status of the pre-processing cells before the setup are complete (Green check marks). You will be prompted to a "Save as" window. Choose the appropriate file name and directory. For this example, we name it: input_batch.dat. 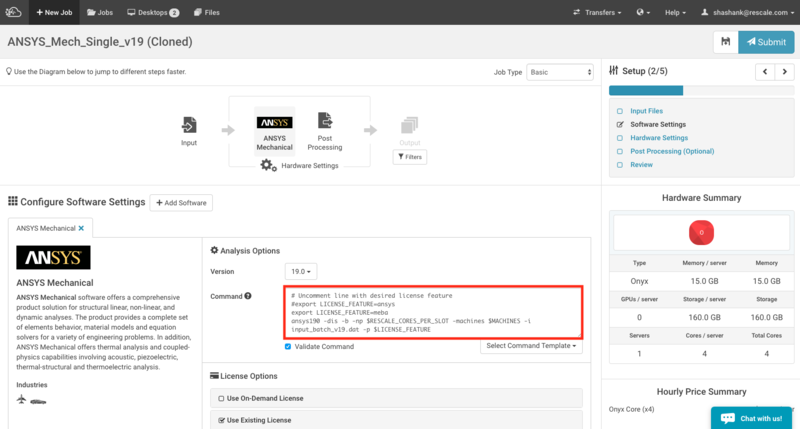 Go onto the Rescale platform, start and name a new job, and upload the input file that you generated from Workbench. 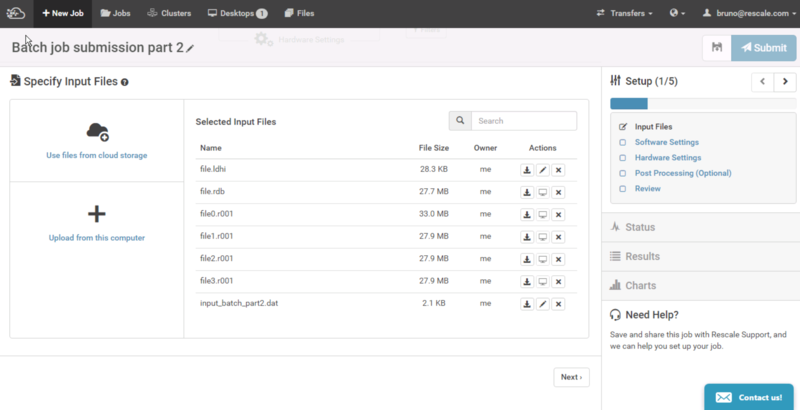 You can either upload the input file from your local computer or from the Rescale cloud files. For this example, configure the software settings by selecting Ansys Mechanical version 18.0. For more information on launching a basic job, please refer to the tutorial here. Under the command window, you will need to specify the input file name under the angle bracket <input-file>. In this tutorial, the command will be as highlighted below in the picture. Specify your license option, and move onto hardware settings. This example will be run on 4 Onyx cores. There is no post-processing options here. Submit your job, and feel free to monitor the status of your job and get information about your cluster in real-time. A guide on "Monitoring Status" on Rescale is found here. Once the job is completed, you can select the file(s) that you wish to download. Note: If you have large output files, it is recommended that windows users use Rescale Transfer Manager (RTM) to download files faster onto your on-premises workstation. More information about RTM can be found here. Linux or Mac user can use Rescale CLI to download larger output files. A Browse for folder window will open, select a destination where you want to save the job results and click ok. It will download and wait until the status shows "Complete". The files will be saved into a folder named after the job. In the Open window, find the directory you specified earlier. This example is a Rescale Basic job and the output files will be under the "run1" folder. 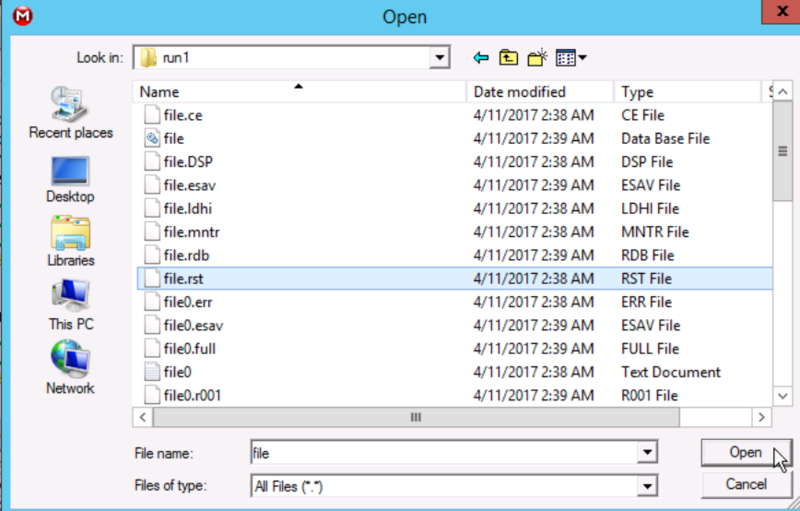 Select the file.rst file and click Open . Wait for the results to completely load into ANSYS Mechanical. One way to verify this is to look at the tree and the Solution (A6) state should appear "green check marked"
Important: You must preserve the directory where the .rst and all other result files are located. Failure to do so may result in files not loading on Workbench. At this point, you can proceed to your post-processing activities as you would normally do after solving an Ansys Mechanical simulation in the Workbench GUI. The focus of this section is for ANSYS Mechanical in batch mode for multi frame analysis. In several cases, the analysis may consist of more than one system. Therefore, an input file must be generated for each system. 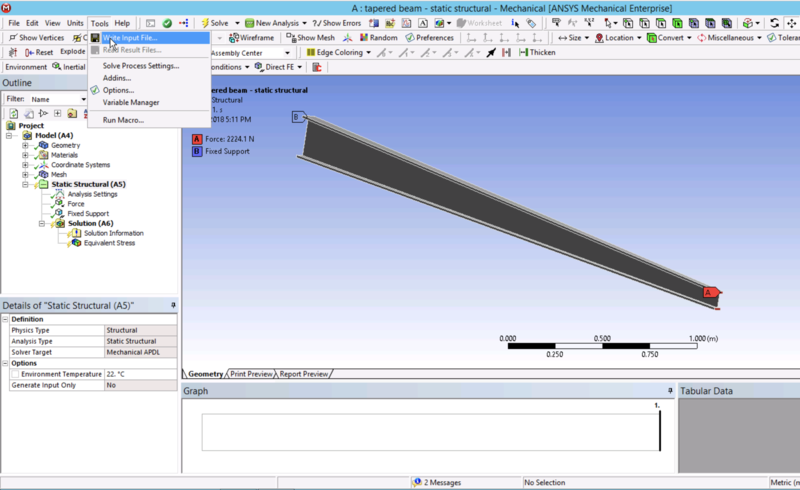 In this example, the solution for tapered beam from previous section is the base analysis. We are interested in finding the critical load of the beam under buckling using Eigenvalue Buckling analysis. To continue, we need a second input file in System B plus the restart files from System A. Refer to ANSYS documentation for more information about multiframe restart and APDL. Please check that the status of all pre-processing cells are complete (Green check marks). Addtionally, check that the two systems are connected and that the solution from system A is connected to the setup of system B. Open ANSYS Mechanical and hightlight the Solution (B6) state instead to write a second input file. Start a new job and upload this new input file. For this eignevalue buckling example, we also have to upload the .rnnn, .rdb, and .ldhi restart files from the base analysis. The rest of the workflow for job submission is the same as previous section. After the job submission, please make sure to include the updated job files to the rescale desktop for viewing the results. 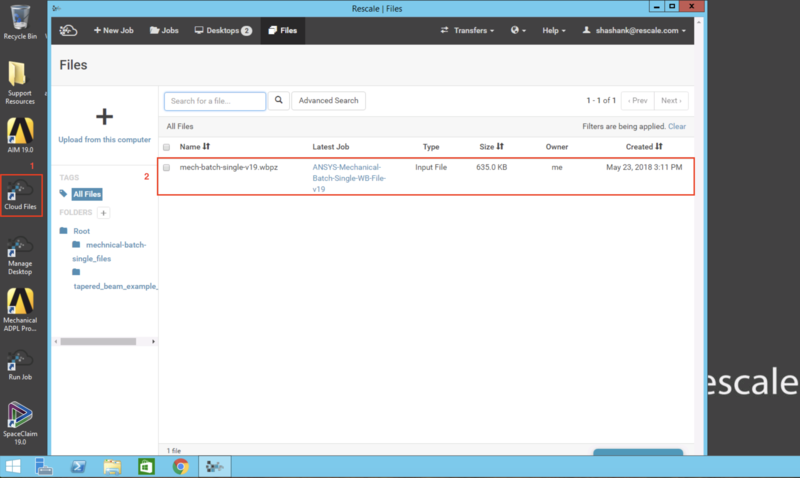 Upload your archived workbench file to the rescale cloud and download it to the rescale desktop. 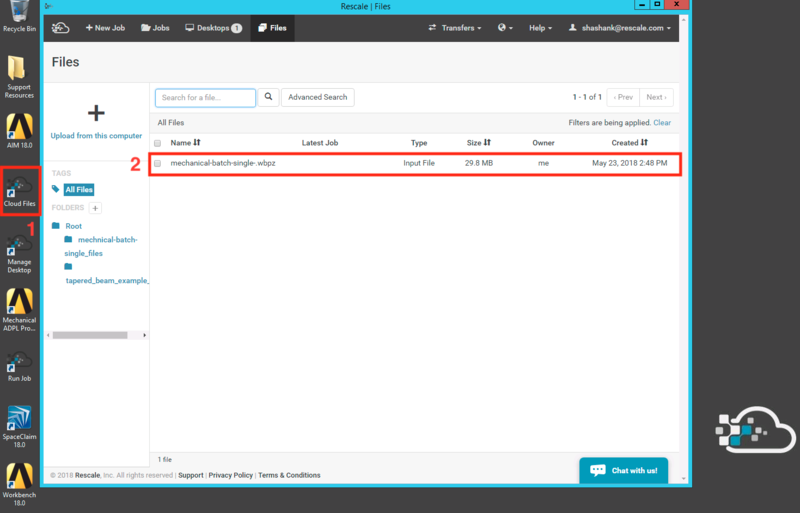 Restore the archive file on workbench and hightlight the Solution (B6) state to read the new result file. The simulation in this example calculated a load multiplier of 4.709. Since we applied 500 lbs of force, this means that the critical buckling load is 2355 lbs of force. 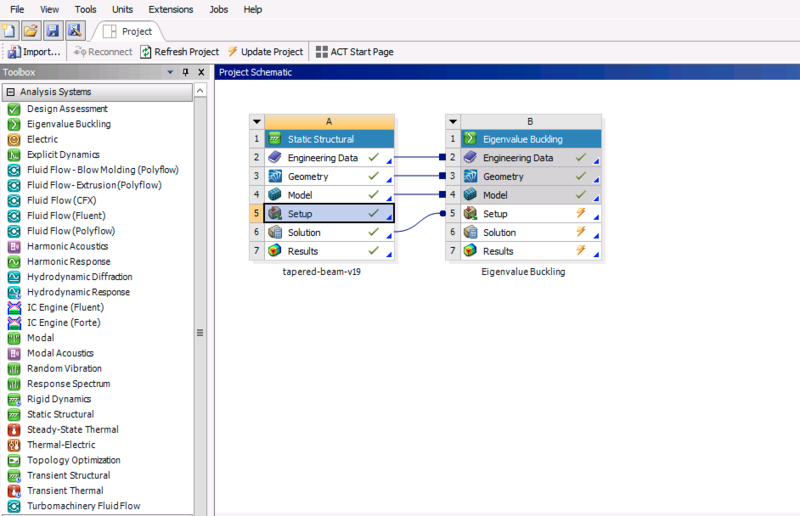 This tutorial focuses on static structural analysis for a tapered beam in ANSYS Mechanical 19.0 and demonstrates how to submit the run as a batch job on the Rescale platform. The example model is a 15-foot long tapered I-beam made of steel. It&apos;s fixed at the larger end and a 500-lb force is applied at the smaller end. To obtain the Workbench project file (.wbpz) for the tutorial, please click on the Import Workbench project link below and click on the Save option located on the top right corner of the job submission page to have a copy of this file in your Rescale cloud files. For this example, configure the software settings by selecting Ansys Mechanical version 19.0. For more information on launching a basic job, please refer to the tutorial here. The simulation in this example calculated a load multiplier of 4.7012. Since we applied 500 lbs of force, this means that the critical buckling load is 2350.6 lbs of force.